I’ve been showing a lot of abstract stuff lately, likely because it’s what I’ve been shooting. Usually, when I walk by a location, I think “oh, I want to put a PERSON in there” for a portrait, so I have to force myself to rethink and look at the details that drew me to a spot in the first place. So no, I wouldn’t put a PERSON in a 1 foot square piece of iron bridge, but the bridge itself is a popular portrait location (actually ran into a guy on the job while we were there). But why not focus on some of the specifics, the details of an already great location? You might inadvertantly turn up a few new ideas to apply to your portraiture as well. I have a few more shots up on flickr if you’ll hazard a peek. Posted on Monday, October 18th, 2010 at 10:29 pm. 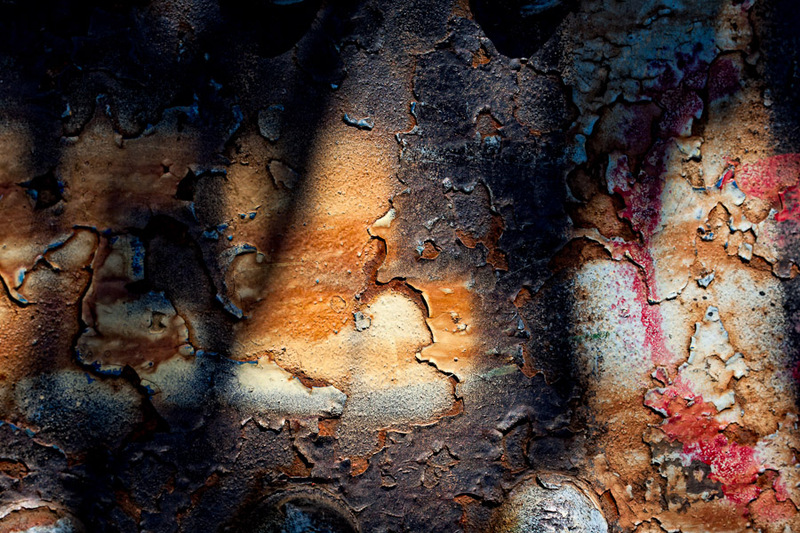 Filed under: Uncategorized Tags: Abstrat, Grafiti, Paint, Rust, Texture	RSS 2.0 feed. Pretentious? That would imply some sort of pretense… I don't see the pretense here. On the other hand, if I'm going to be a bit pretentious myself, I'd posit that this is not an abstraction of anything (ergo, not an abstract photograph). But meh. Everyone these days uses "abstract" as short-form for "no immediately recognizable forms" so I'll buy it. Whatever you want to call it, I think it's got interesting shapes and colour, plus well-used light and shadows. Isn't that enough?